• Konjac Sponge is made from 100% pure, natural konjac dietary fiber (a pure vegetable fiber) from the root of the Amorphophallus konjac plant. • The unique net like structure of the sponge, gently massages the skin and stimulates blood flow and new growth of skin cells. Plant Based Powerhouse Cleansing Tool! Konjac is pronounced KOHN-yak and is a God Given Miracle for safely, and deeply cleansing the entire face or eye area without pulling or tugging or irritating delicate eye tissues. The Brenda Christian Konjac Sponge is made from the root of the Asian plant Amorphophallus which also has both nutritious and edible components. Because of the origin of our 100% natural Konjac Sponge, our sponges are both biodegradable and compostable. The true beauty of the BC Konjac Sponge is that although the sponge was originally designed to cleanse affluent Japanese Babies’ Skin nurturing the most delicate of skin, Konjac provides deep, powerful cleansing that removes dead, skin cells, makeup and toxins from the surface of all skin types. By focusing it’s use on the eye area many viable anti-aging benefits manifests. Brenda Christian Konjac Sponge strengthens the skin with its naturally occurring plant characteristics. In fact, the “Konnyaku” which is the tuberous root of the Arum genus of the Amorphophallus plant is ground and used in modern, exclusive Japanese paper making processes to provide specialty writing papers with moisture and elasticity. Like the benefits imparted to perfecting paper, the Konnyaku provides an exclusive mucilage which, while allowing the skin to breathe and absorb moisture makes the skin more flexible and strong. The Brenda Christian Konjac Sponge utilizes this gel like texture to retain moisture and elasticity as it works with Gentle Cleansing Milk to deeply cleanse the eye tissues, eyelashes, and eyebrows. Fill a small bowl with clean, filtered water and place your Brenda Christian Konjac Sponge in the water. The sponge will triple in size as it’s natural fibers fill with fluid. 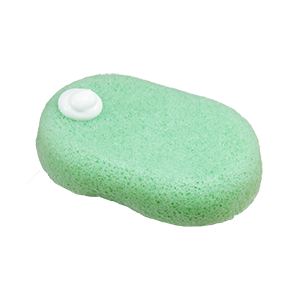 Lift the Konjac Sponge from the water and squeeze to remove excess moisture. Apply ¼ teaspoon of Brenda Christian Gentle Cleansing Milk to the tip of the Konjac Sponge and press on the skin surrounding the eyes, including eye brows. Massage the Gentle Cleansing Milk with fingers working in a circular motion working inward toward the nose above the eyes and outward away from the nose below the eyes. Continue for ten quick rotations. Rinse fingers. Then, massage the Konjac sponge in the same direction around each eye. Rinse with clean water and repeat. Your eyes will be thoroughly cleansed but you will notice an immediate improvement in the skin surrounding your eyes. The skin will feel hydrated and elastic with an immediate reduction in the appearance of fine lines. 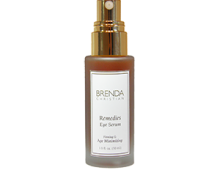 Now, pump one half to one full pump of Brenda Christian Remedies Eye Serum into your palm and with fingertips, massage over the entire eye area in the same direction that you cleansed. Do this each evening before sleeping. 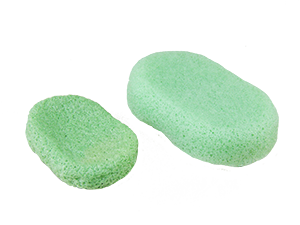 For extended longevity of your sponge, always squeeze out excess moisture after use and allow it to hang in an airy place to dry. After use, rinse your Konjac Sponge with clean water & hang it from the attached string for air drying. Select a drawer pull or door knob convenient to the area where you choose to cleanse or place a little hook in your chosen spot. As your BC Konjac Sponge dries and water is removed, it is toxin free and prepared for it’s next use. Your Konjac Sponge should be replaced every two to three months. Perfect For Travel: As your Konjac Sponge dries, it will again become firm. This makes your Konjac Sponge perfect for travel as it is always ready to be re-wet and used protecting your face and especially your eyes from strong detergents that can be used in hotel laundries. If you need to travel before your sponge is completely dry, no worries…. just insert into a zip lock bag and rinse and hang upon reaching your destination. Who Can use the Konjac Sponge? Brenda Christian’s Konjac Sponge is suitable for all skin types. It is especially ideal for delicate skin areas, problem or irritated skin, extremely dry skin, oily skin and skin prone to hormonal break outs or acne. Is a Konjac Sponge suitable for Senior Citizens with thin skin? Senior citizens can suffer from thinned skin which breaks and tears easily. The Brenda Christian Konjac Sponge is especially soothing to this skin type. Can Those with Acne Prone Skin use the Konjac Sponge? 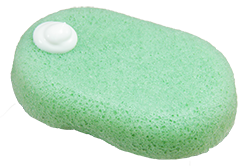 Yes, by gently but deeply cleansing, the sponge will remove the impurities that are causing the blemishes while not irritating skin which is in the healing process. Will a Konjac Sponge help with In-Grown Hairs? 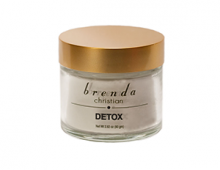 Cleansing daily with the Brenda Christian Konjac Sponge and gently massaging the areas where in- grown hairs are occurring, will assist in the removal of dead skin cells. The added benefit of increasing circulation through gentle yet not irritating massage allows trapped hairs under the skin the opportunity to be released naturally through the skin. How Often Can You Use the Konjac Sponge? You may use your Konjac Sponge as often as you prefer, but Brenda Christian recommends always using before bed with Gentle Cleansing Milk to cleanse away makeup, dead skin cells, and surface debris from our environment. You should also cleanse first thing in the morning with either a filtered water filled Konjac Sponge or your preferred morning cleanser. How Long Will My Konjac Sponge Last? Each sponge has an average life span of 3 months. Hang from attached string to dry between uses. Konjac Sponge Use By Licensed Professionals. 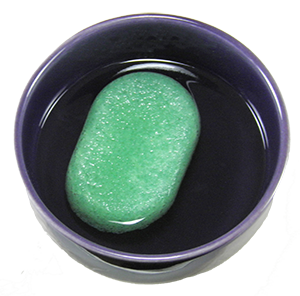 The Brenda Christian Konjac Sponge can be sterilized by placing in freshly boiled water for several minutes. Remove and allow to cool. This is of course being mandatory for estheticians who want to reuse the sponge on their clients; however, Brenda Christian recommends a small add on charge and allowing professional clients to take home the “Used Once Konjac Sponge” which has been used during the client’s service.